Have you been overwhelmed thinking about how you can best pay off any debt you have? There are several strategies you can use to achieve debt freedom, but you might be unsure which is right for you. One thing is certain: if you don’t have a plan, it’s not going to happen, especially if you have several different types of debt. Paying only the minimum on your debt isn’t going to help you – you’ll end up paying a lot toward interest, and a little toward principal. That’s why being aware of these 3 methods of debt payoff is crucial. Each will help you pay down your debt faster so that you can be free from it sooner, because they require that you focus on paying more toward one specific debt. As a sidenote – it’s much easier to evaluate which method you should use if you have all your debt listed out. You should know the interest rates, minimum payment, and balances. You should also take into account how much extra you can pay by adding up your minimum payments and taking a look at your budget. If there’s no room to pay more, think about ways to make more money. Let’s take a look at each of these methods, and then we’ll help you decide which path to take. The avalanche method is the mathematical approach: you target the debt with the highest interest rate first, as it’s costing you the most. Using the debt avalanche method, you’d focus on paying back credit card #1, as it has the highest interest rate out of all your debt. That means you should put any extra payments you can toward credit card #1, and pay the minimum on the rest of your debt. You don’t take your balances into consideration with this method. The snowball method is often referred to as the more psychological/emotional approach: you target the debt with the lowest balance first, because that will presumably give you the “quick win” you need to gain motivation and momentum in paying the rest of your debt off. Using the same list of debt as above, your focus would be on your student loan, as it has the lowest balance of all your debt. Do the same thing – put any extra payments you can toward your student loan, while paying the minimum on all the rest. Once your student loan is paid off, you can then snowball the payment you were originally making toward it (say you were paying $200 toward it) into the next debt. In this case, that would be credit card #1. So if the minimum payment on that was $150, you’ll now be able to pay $350 ($150 was the minimum you were paying, + $200 from your student loan payments) toward it. This greatly accelerates your progress! The snowflake method is a spin-off of the snowball method. If thinking about tackling a bigger balance with a huge lump sum payment is intimidating, then the snowflake method will be appealing. You can take smaller, more achievable steps toward debt freedom, while targeting your debt in order from smallest to largest, by paying a smaller amount toward your debt, but with greater frequency. For example, say you can afford to pay $200 extra toward your debt, but you can’t afford to make that payment in one shot. Instead, you can divide it up throughout the month – making a $50 payment each week is the same thing, but it’s less of a burden on your cash flow. In addition to this, any extra money you get should be immediately applied toward your debt. If you saved $16 at the grocery store, put it toward your debt. Found a $10 bill in your coat pocket? Earned $50 from a garage sale? Got $15 cash back from a survey? Put it all toward the debt you’re targeting. Essentially, these little amounts will add up big-time over the course of a few months, and you’ll be making progress in no time, while feeling less burdened. 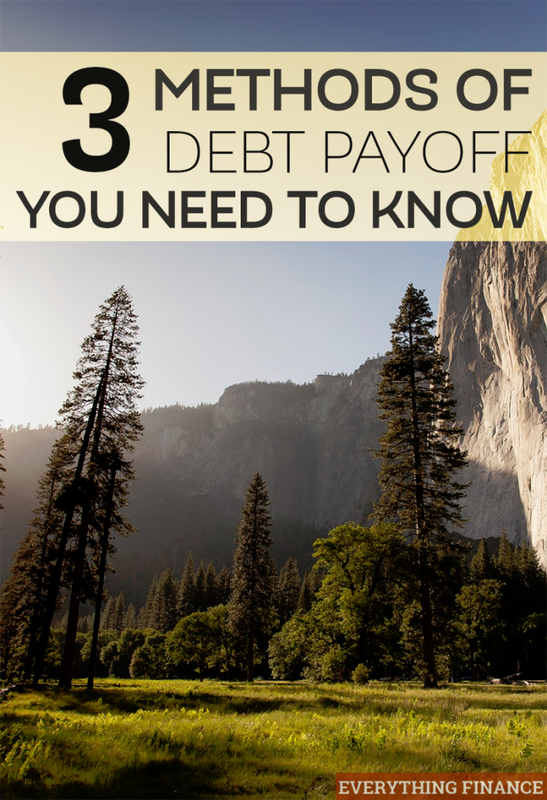 This might not be the answer you want to hear, but there are no right or wrong routes you can take with debt payoff. As long as you’re actively paying it down and not accruing any more debt, you’re doing well! Again, the worst thing you can do is pay the minimums and bide your time. Do you really want debt hanging over you for the next several years? Probably not. Being debt free enables you to do so much more with your money. Your entire paycheck will be yours to keep and to allocate as you wish. If you’ve been struggling with getting motivated to pay off your debt, you might want to start with the snowball method. Going through the process of paying off just one debt may be what you need to kick-start the rest of your debt payoff journey. If you have super high interest debt (usually credit card debt), you might want to consider using the avalanche method. The interest could be costing you a ton, and the sooner you pay that debt down, the less you’ll be paying toward interest. If you have irregular sources of income, then the snowflake method might be your best bet. Paying smaller amounts frequently could be easier on your budget. It’s all about what’s going to leave you with the most motivation for crushing your debt. The avalanche method is mathematically sound, but if you find yourself down about your debt, and close to giving up, then you’re better off trying something else. Think of it as an experiment, and don’t be afraid to try a combination of these methods. You don’t have to stick to one the entire time you’re paying off your debt. What method has worked well for you in paying off debt?